Our purpose at IRONWILL FOOTBALL is to build up young athletes into leaders and improve their football skills and positional knowledge. Our goal is to provide the kind of superior football instruction and leadership training that every young athlete will remember for the rest of their lives. 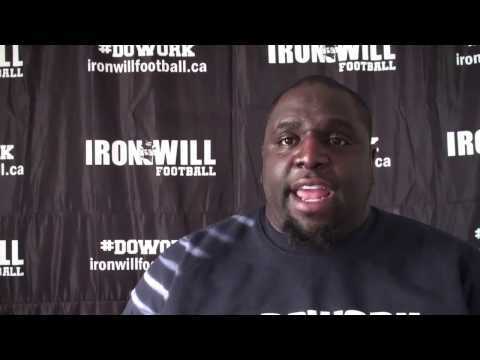 I built IRONWILL FOOTBALL Performance Camps based on my own amazing experiences as a student-athlete, recreation leader and a football coach. Our approach in coaching and teaching young athletes is to focus on a truly positive experience. 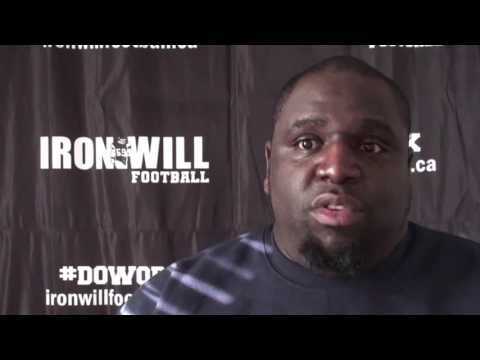 I would like to thank you in advance for investing in your son or daughter’s football athletic development with IRONWILL FOOTBALL. NCCP Defensive and Offensive line position coach trained. 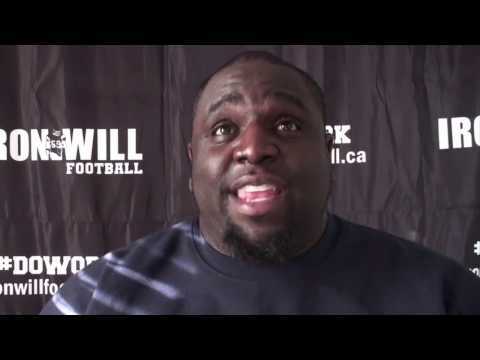 St. Mary’s Huskies University Football – Defensive Line Coach. Tim Burris is tenacious, hard working and has great passion for football. Tim was recruited out of Champlain College in Lennoxville, Que to Saint Mary’s University. Tim was able to be a true freshmen starter on the 2002 championship team. In the four years at Saint Mary’s University he was able to be a part of 2002 Vanier Cup champion team and the 2003 Vanier Cup finalist. Hard work payed off for him as he was invited to the East-West Bowl in 2004. He was Team Linemen of the Year in 2004 as well as two-time Atlantic University Sport All Star 2004-2005. He graduated in 2006 and transferred to the University of Calgary under Head coach Blake Nill for his 5th year of eligibility. Tim was able to bring his defensive line experience and help boost the Calgary Dino’s to the playoffs. Tim has a great desire to give back to young football players. He would like to pass on the knowledge and tools that he was given to succeed through various football camps. Tim’s biggest goal is to give back to the community. 2017 – Present defensive line coach St.Mary’s Huskies University Football. 2016 – Present defensive line coach for the Alberta U18 team. 2012- Attended Edmonton Eskimo Coaches Clinic. 2009- Hunting Hills High School Conditioning and Position Coach. Prepared and executed practice and game planning. Instilled football knowledge to players, worked on conditioning training techniques, weight training, speed and agility, and, basic position specific skills. 2008- Youth Worker – Identify personal strengths and resources for positive change as well as goal setting and resume writing. 2007 Child and Youth Worker – Coordinated treatment, interventions as well as assist clients with standard living skills. 2006- Refereed the Saint Mary’s flag football league. 2003 – The Anti-Bully program in Halifax, NS. Public speaker for Bullying Awareness at speaking events held in the local Elementary and High Schools. 2002-2004 Saint Mary’s University Football camp – Teaching fundamentals, sportsmanship and basic knowledge of the game. 1999 – North Toronto Day Camps Leader and Team Leader for city and regional summer sports tournaments. 1998 – 1999 Toronto Parks and Recreation – Worked as a Playground leader, head coach of two city championship teams in soccer and in baseball as well as coach Winter Drop-in basketball at various high schools. 1997 – Junior boys camp counsellor at Bolton Camp. Responsible for leadership and guidance in daily living skills as well as the planning of the overall camp activities. 1995 -1996- Completed Counsellor In Training Level 1-2 at Moorelands Camp Dorset Ontario. Moorelands focuses on inner- city youth, 8-9 years old who come from single parent backgrounds and troubled families. 2003- Atlantic conference champion, Vanier Cup finalist. 2004- Selected to East West Bowl, (AUS) Atlantic University Sport All Star and Team Lineman of the Year. 2005- Atlantic University Sport All Star. Talk about your playing career and football accomplishments and football teams you played for? I started playing football in high school and continued on playing at Champlain College in Lennoxville, QC. During my time at Champlain I won a championship and team Most Valuable Player (MVP). I moved on to St. Mary’s University and played from 2002- 2006. In 2002, I was on the National Championship team that won the Vanier Cup. 2004 and 2005 I was an Atlantic University Conference All Star as well in 2004 I was Team Lineman of the Year. In 2005, I was one of the Captains of my team in the invite-only CIS East West Bowl. My last year of university eligibility I transferred to the University of Calgary where I was a part of returning the Dino’s back to the playoffs. What is your coaching background and any coaching clinics or development courses you have taken? My coaching career began with coaching at the St. Mary’s University Camp of Champions summer football camps where I coached the defensive line. I moved on to coaching high school football where I was a positional coach. I was also the defensive coordinator for one year for the Central Alberta Buccaneers men’s football club in Red Deer Alberta. Currently, I am going into my fourth year coaching with the Calgary Colts Junior Football team and I am the defensive line coach. At the provincial level, I am the defensive line coach for the Alberta Under 18 team and we compete in the Canada Cup each summer. I have attended numerous coaching clinics such the Edmonton Eskimos and the University of Alberta Golden Bear coaches clinic. I have also taken National Coaching Certification Program (NCCP) courses to improve my coaching knowledge. Why do you enjoy coaching football? I enjoy coaching because it allows me to teach young players what it takes to be successful on and off the field. Most players have goals of playing football after high school and it is my duty as a coach to provide valuable insight that paves the way for those players to be successful. I feel like a big brother to the players who attend our camps. Being able to provide football instruction and life skills on our platform is an opportunity that is second to none. What is one thing players should know about you as a coach? Players should know that I will never give up on them. I know how great of a feeling it is when coaches didn’t give up on me. At camp we will get through any struggles together! I believe that limitations are a smoke screen. Beside being a great football coach, are there any other skills you hope to develop in the athletes you coach at the IRONWILL FOOTBALL Camps? I want players to know that the preparing for a season and playing sports is very similar to real life. The effort players put into becoming a better football players is the same effort required to succeed in life. There is not a perfect pathway to success. There will be challenges on and off the field and it comes down to the individual decision on how they will take on the challenge. Leadership, Accountability, Respect and Knowledge are all characteristic that are keys to success in life and are taught at IRONWILL FOOTBALL camps.